New Family Day and Country Fair Day. Come see what Saul is all about! Enjoy many activities and see our students in action on May 11. New family activities start at 10:30 and the Fair runs from 11-3. The Saul Coat-Of-Arms (or Shield,) is divided into three sections: the Dexter Chief, the Sinister Chief and the Bottom Field. The Dexter Chief (top right as the shield is carried/top left to the viewer,) is the Coat-Of-Arms of the William Penn, for whom Pennsylvania is named. The Sinister Chief (top left as the shield is carried,) depicts the clipper ship which appears on the Seal of the City of Philadelphia, denoting the location of the school. The Bottom Field shows an open book, signifying the educational values of the school. Superimposed on the book are a plow and a cornucopia, which are indicative of the agricultural education provided by the school. 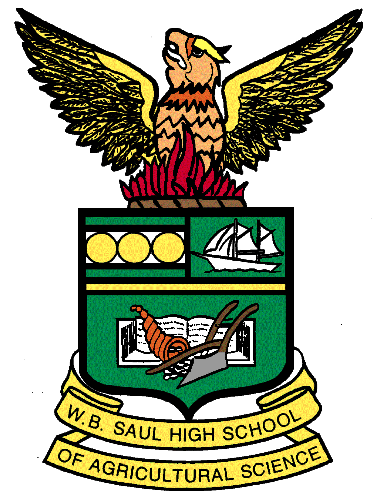 Above the Coat-of Arms is the school’s mascot, the Phoenix bird, emerging from the flames. Below the Coat of Arms is the Ribbon, boldly proclaiming the name. The agricultural program was founded in 1943, when classes and practicums were held at the Shallcross School. In 1945, the program moved to the Widener Memorial School at Broad Street and Olney Avenue. In 1948, a new classroom center was opened at Howe Elementary School at 13th and Grange Streets. Classroom activities were moved to Howe and the practicum remained at Widener. The School District acquired the property at 7100 Henry Avenue in 1950 (formerly a retirement home,) along with a 99-year lease on the property east of Henry Avenue. The practicum moved to Henry Avenue, and classroom activities to Gratz High School. In 1951, the classes and practicum were united at the present location, the school was renamed the Wissahickon Farm School and operated under that name until 1957, when the old buildings underwent major renovations. With the improvements to the facility came a new name: The Philadelphia High School of Agriculture & Horticulture. Dedication of the current academic building took place in 1961. Walter Biddle Saul was a prominent attorney in the city of Philadelphia, and a partner in the law firm of Saul, Ewing, Remick and Saul, but is perhaps better remembered for his distinguished and dedicated service as the President of the Philadelphia Board of Education. During his long tenure with the Board, he was a staunch supporter of the programs of Wissahickon Farm School/ Philadelphia High School of Agriculture & Horticulture. In fact, the school was only made possible through his foresight and determination to have the necessary funding provided by the Board. In 1966, in recognition of his contribution to public education and his devoted patronage of the school, the Board of Education changed with name of The Philadelphia High School of Agriculture & Horticulture to the Walter Biddle Saul High School of Agriculture and Horticulture. Walter Biddle Saul was the first (and remains the only,) living person to have had a public high school named after him in the city of Philadelphia. In 1967, a spate of construction added the science wing and MPR to the main building and the meat lab, and dairy barn across the street. In 1969, the Board changed the name to the current Walter Biddle Saul High School of Agricultural Sciences, to reflect its expanding agricultural focus. In 1976, the latest phase of expansion took place, with the addition of the agricultural building, the gymnasium and the equipment barn (now the horse barn) to the campus.